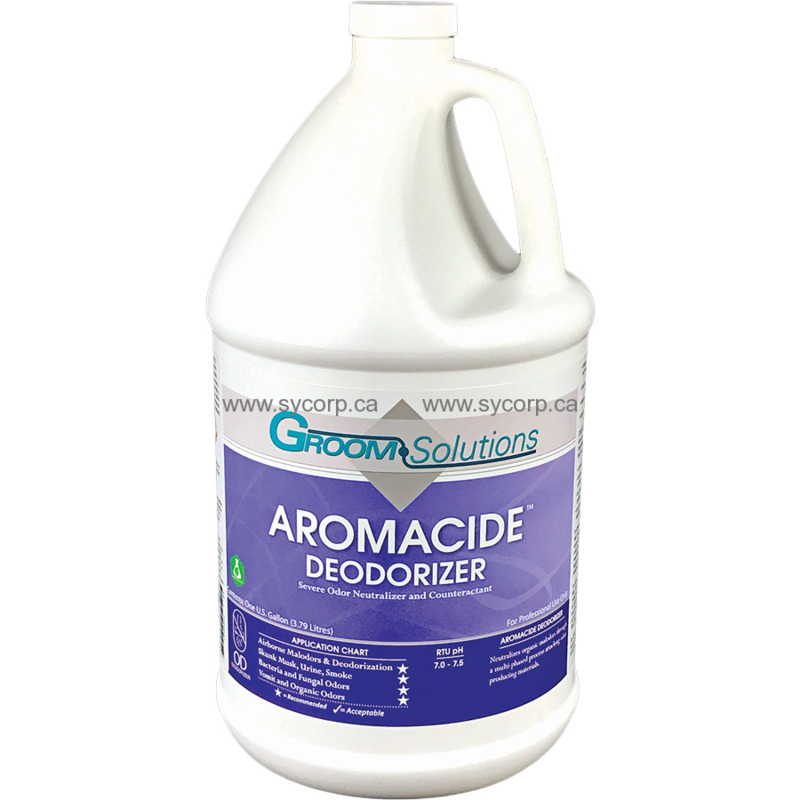 Aromacide Deodorizer has been specially formulated to counteract and neutralize organic malodors through a multi-phased attack on organic odor producing materials. It works effectively on a wide variety of common and specialized odor problems, including airborne malodors, skunk musk, urine odors, smoke odors, bacterial and fungal odors, stale odors, vomit, and many other organic and protein odors. The multi-phase attack first physically bonds to the odor, surrounds it with a odor barrier, and then leaves a fresh fragrance in its place. This product positively neutralizes odors and does not just "mask" them. Regardless of the malodor you are treating there are several steps that you can take to assist in treating the area. • Flush and physically remove or extract as much of the contamination as possible before deodorizing treatment. • You must apply a volume of deodorizing solution equal to or greater than the volume of odor causing material. • Saturate by spraying areas of contamination with your Aromacide deodorizer to recreate the conditions that caused the odor. fogging, area must be vacated of pets and unprotected people for 30 minutes after treatment. Mix 1 part solution with 4 parts water. Saturate spray or pour mixed solution onto contaminated area. Consider application with an injection system deep into the carpet cushion and subfloor. For best results, allow to dwell for 15 minutes before extraction with a sub-surface extraction tool such as the Spot Lifter, Water Claw®, or Flash Xtractor. Add up to 8 ounces per ready to use gallon of pre-spray to deal with minor odors during the cleaning process.